Samsung's flagship smartphone has received the rough and tough upgrade that we were all expecting. The Samsung Galaxy S7 Active is set to release exclusively through AT&T on June 10. Much like the Samsung Galaxy S6 Active, the S7 Active is clad in a camouflage design that you'll either love or hate. It also replaces the capacitive buttons of the Samsung Galaxy S7 with physical ones, and ditches the glass build with tough plastic all around the edges to make it more drop-proof. This is a phone that puts function over form, unlike the S7, which holds them in near equal regard. Internally, the Samsung Galaxy S7 Active is a powerhouse. The 5.1-inch screen runs at 2,560 x 1,440, which is the same resolution as last year's device. Interestingly, Samsung opted for the Snapdragon 820 instead of its own Exynos SoC that it used in the non-US version of the S7. The S7 Active is obviously made to withstand an intense beating, and its huge 4,000mAh battery only adds to the already impressive list of specs. The S7, by comparison, has 3,000mAh and the Nexus 6P packs 3,450mAh. Will the S7 Active see the world over? While it's unfortunate that this device won't make it outside of the United States, there isn't all that much to be jealous of. The Galaxy S7 doesn't have as big of a battery, but that's really its only downside by comparison. It has the same processor, screen quality and IP68 protection. You can essentially turn your S7 into an S7 Active by putting a case on it. Is there any hope at all that this phone will release outside of the US? We asked AT&T, which told us that "at this time, we're not announcing any plans to launch the phone outside the U.S. market." 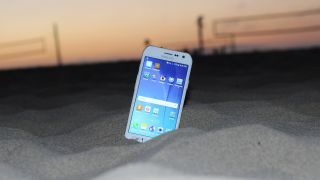 Who knows, maybe we'll see the S7 Active floating into new waters soon enough.